But the stunning victory Julian had scored at the battle of Strasbourg had shocked the Germans. The glow of invincibility it conferred allowed him to follow up with some effective diplomacy that ensured the peace he had created would last. The watch on the border was as a consequence lighter than usual. Most of the strain was being taken by some auxiliary units from the tribes of the Batavians and Heruli, who had been settled inside the empire just over the borders as the first line of defence. But there was quite a bit else going on with the tribes over the border to keep them sweet, and this included a judicious amount of outright bribery. But on the accession of Valentinian there was a misjudgement about the appropriate level of the presents that were given to particular chiefs to mark the ascension of a new emperor, and in the winter of 365 a huge force of disgruntled Alamanni swept across the Rhine, overwhelming the Roman’s allies and smashing two Roman generals sent by Valentinian to turn them back. Valentinian’s attention could have been distracted by the rebellion of Procopius against his brother in the East. The story is that he received the news of the two threats while in Italy on the same day and considered marching to the aid of his brother. But he chose to give his attention to Gaul. He marched to Paris and set about training and organising his forces with meticulous care. The officers of the Bativians and the Herulians were held to have exhibited cowardice and were discharged ignominiously. Reading between the lines this was probably a cover for a reorganisation and the appointment of some more professional soldiers to the key ranks. The rank and file of the Batavians and Heruli themselves begged to be allowed to go back to war to rebuild their reputations. Or so we are told. I don’t want to sound cynical again, but this sounds like spin to me as well – defending their own property would have been motivation enough. Likewise, the story that their previous general had complained that the task of taking on the Alamanni was too difficult sounds like a blame game to divert attention from failings higher up to me. But there certainly was a new general. His name was Jovinus and he set out with the reorganised auxiliaries against a much more numerous enemy. Once the campaign started, discipline and military skill rather than raw numbers proved to be decisive. 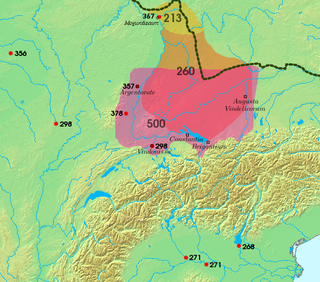 The Alemanni were by now scattered over several provinces. Their goal was plunder so it was necessary to spread out to find it after all. Jovinus managed his counter attack skilfully, taking groups of the enemy unawares and then forcing a decisive engagement near Chalons which inflicted heavy casualties and captured some important prisoners. He then chased the remnants to the Rhine. He returned in triumph to Paris where Valentinian praised him and made him consul for the year. Some key prisoners had been captured, and these were killed including a king and his successor. This was a sign of weakness or poor judgement, as I’ll explain later. That weakness was shown when a new influx of Alemanni led by Rando captured and looted undefended Maintz. If this city was really undefended that was a foolish move. Its key position where the Main meets the Rhine, not far from modern Frankfurt, would have made it a lynch pin of the frontier. It held this strategic significance throughout history whenever there was conflict between France and Germany. It was the point at which Patton launched the invasion of Germany in 1945 for example. So it was imperative that the Romans recaptured it. It was time for Valentinian himself to take to the field. Rando didn’t fancy his chances and retreated without a fight but with plenty of loot and captives. An insult like this could not go unpunished and Valentinian launched an attack co-ordinated with troops from Italy. He pushed deep into Germany seeking a confrontation with the man who had so effectively thumbed his nose at imperial authority. But operating far from supplies and communications was perilous. He had a sticky moment when he got detached from the main body of the army. He was surrounded by enemies and only escaped death by plunging down a steep slope leaving his elaborately decorated helmet behind along with his cup bearer. Being an emperor was not a cozy job. But while they no doubt enjoyed pinching his gear, the Alemanni had no stomach for a full scale battle with Valentinian. Rando repeated his previous tactics and avoided conflict, retreating to a high plateau which would be difficult for the Romans to attack. This strong point was located and assaulted on three sides by the Romans, who prevailed inflicting heavy losses on but also losing many men themselves. Although it was a victory and gave Valentinian the initiative, it was not the ringing victory like the one that Julian had inflicted with minimal losses against a confident opponent who outnumbered him. The Romans were back to human scale again. And while it was no doubt necessary, there was another potential downside to a bloody victory inside enemy territory. The Romans would never be able to hold the frontier against a determined and united attack by the Germans. Their only hope was to sow dissension between the tribes. This was a tactic that had been used since the time of Augustus and the Romans were good at it. As luck would have it at that point the two biggest tribes, the Alemanni and the Burgundians were at loggerheads over access to some salt pits. The Romans had something to work with, but they had to maintain the balance of power between the tribes. This was why the killing of important German prisoners was almost certainly a mistake. It wasn’t really a question of humanity, more that alive they would always be available to be used in some capacity or other in keeping the tribes and their lords the way the Romans needed them to be. Divide and rule is far and away the cheapest solution, but only a fool would rely on it. Valentinian was no fool and he devoted his attention to fortifying the frontier as far as he could. This obviously cost money, but in Valentinian’s mind it was more important than winning short term popularity with a tax cut. This series of campaigns reveals a lot about Roman Gaul in the Fourth Century. The Romans were in a weak and vulnerable position. Their biggest problem was lack of manpower, and it was a problem that could not be solved in the short term and as we know now was never going to be solved. They attempted to overcome their lack of sandals on the ground by training, discipline, good tactics and diplomacy. In all this, strong leadership was the key. We see this in Julian’s restoration of the province and again with Valentinian’s effective management of what could have been a major setback. The fate of the empire rested very much on the quality of man that ended up with the top job. Nobody actually wanted to destroy the empire, not even the barbarians. But it could only be preserved by good management of all the frontiers. Poor judgement or even simple lack of attention at the top could be risky. There was also the risk of distractions like internal strife within the empire. It also relied on the situation over the borders remaining roughly stable. But there plains beyond Germany stretched all the way to China. Only a few years after the victory of Valentinian against the Alemanni the first report came back of a new tribe called the Huns. There was no way that Valentinian could have had the slightest idea that these new players were going to change the rules of the game beyond recognition. In any case, the Rhine wasn’t the only place that needed his attention.